This article is about the 1998 film. For other films titled Godzilla, see Godzilla (disambiguation). Godzilla is a 1998 American monster film directed and co-written by Roland Emmerich. The film is a reimagining of Toho's Godzilla franchise and is the 23rd film in the franchise and the first Godzilla film to be completely produced by a Hollywood studio. [Note 1] The film stars Matthew Broderick, Jean Reno, Maria Pitillo, Hank Azaria, Kevin Dunn, Michael Lerner, and Harry Shearer. The film is dedicated to Tomoyuki Tanaka, the co-creator and producer of various Godzilla films, who died in April 1997. In October 1992, TriStar Pictures announced plans to produce a trilogy of Godzilla films. Jan de Bont was hired in July 1994 to direct the film based on a script by Ted Elliott and Terry Rossio. De Bont left the project in December 1994 due to budget disputes and Emmerich was hired in May 1996 to direct and co-write a new script with producer Dean Devlin. Principal photography began in May 1997 and ended in September 1997. Godzilla was released on May 20, 1998 to negative reviews but was a box office success, grossing $136 million domestically and $379 million worldwide; however, it was considered a box office disappointment. Planned sequels were cancelled and an animated series was produced instead. 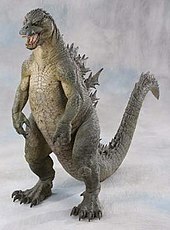 In 2004, Toho began trademarking new iterations of TriStar's Godzilla as "Zilla", with only the incarnations from the 1998 film and animated show retaining the Godzilla copyright/trademark. A marine iguana nest is exposed to the fallout of radiation following a military nuclear test in French Polynesia. In the South Pacific Ocean, a Japanese fishing vessel is suddenly attacked by an enormous sea creature, with only one seaman surviving. Traumatized, he is questioned by a mysterious Frenchman in a hospital regarding what he saw, to which he only replies "Gojira." Dr. Niko "Nick" Tatopoulos, an NRC scientist, is in the Chernobyl exclusion zone in Ukraine researching the effects of radiation on wildlife, but he is interrupted by the arrival of an official from the U.S. State Department. He is sent to Panama and Jamaica, escorted by the military, to study a trail of wreckage across land leading to the recovered Japanese fishing ship with massive claw marks on it. Nick identifies skin samples he discovered in the shipwreck as belonging to an unknown species. He dismisses the military's theory that the creature is a living dinosaur, instead deducing it is a mutant created by nuclear testing. The 120m long creature travels to New York City during the rainy season, leaving a path of destruction in its wake. The city is evacuated before the U.S. military attempts to kill it but fails in an initial attempt. Nick collects a blood sample, and after performing a pregnancy test, discovers that the creature reproduces asexually and is collecting food for its offspring. Eventually, Nick meets up with his ex-girlfriend, Audrey Timmonds, a young news reporter who wants to find a story. While she visits him, she uncovers a classified tape in his provisional military tent which concerns the origins of the monster and turns it over to the media. She hopes to have her report put on TV in hopes to become famous, but her superior and boss, Charles Caiman, uses the tape in his broadcast, declaring it as his own discovery, and dubs the creature "Godzilla". With the classified information released mainly because of his actions, Nick is removed from the operation and abandons Audrey. Soon, he is kidnapped by Philippe Roaché, an "insurance guy" he met before coming to Manhattan. Revealing himself as an agent of the French secret service, Philippe and his colleagues have been keeping a close watch on the events and plan to cover up their country's role in the nuclear testing that created Godzilla. Suspecting a nest somewhere in the city, they cooperate with Nick to trace and destroy it. Following a second encounter with the military, Godzilla dives into the Hudson River to evade the military, where it is attacked by Navy submarines. After colliding with torpedoes, Godzilla sinks. Believing it is finally dead, the authorities celebrate. Nick and Philippe's strike team, followed by Audrey and her cameraman Victor "Animal" Palotti, find the nest inside Madison Square Garden and locate over 200 eggs. Before the French can succeed in destroying them, the eggs suddenly hatch and the offspring attack. Nick, Animal, Audrey and Philippe take refuge in the Garden's broadcast booth and successfully send out a live news-report to alert the military of what will happen if the offspring escape. A prompt response involving an airstrike is initiated as the four escape moments before Air Force jets bomb the arena. Audrey and Nick reconcile and kiss, before the adult Godzilla, having survived, emerges from the Garden's ruins. Enraged by the deaths of its young, it chases the four across Manhattan. After a taxi chase, they manage to trap Godzilla within the Brooklyn Bridge where the returning Air Force jets manage to shoot it down. Godzilla dies from its wounds, while the remaining citizens celebrate. Audrey tells Caiman that she quits working for him after what he did, before leaving with Nick. Philippe (taking a tape that Animal was recording and promising to return it after "removing a few items from it") thanks Nick for his help and parts ways. In the ruins of Madison Square Garden, a single surviving egg hatches and the emerging hatchling roars. Godzilla as designed by Stan Winston. American film producer and distributor Henry G. Saperstein (who had co-produced and distributed past Godzilla films for the American market through his studio UPA) received permission from Toho to pitch a new Godzilla film to Hollywood studios, stating, "For ten years I pressured Toho to make one in America. Finally they agreed." Saperstein initially met with Sony Pictures producers Cary Woods and Robert N. Fried for discussions regarding a live-action Mr. Magoo film but the discussions led to the availability of the rights to Godzilla. Interested, Woods and Fried proposed the idea to Columbia Pictures, but were initially rejected. Woods stated, "We pitched the idea to Columbia and they passed outright. Their response was they felt it had the potential for camp". The two also tried to pitch the idea to TriStar Pictures but were also shot down, Fried stated, "TriStar did originally pass on the project. The people who were running the studio at that particular time may not have seen commercial potential there, may not have thought that it would make a great film." Taking advice from his wife, Woods instead went over the executives' heads and proposed the idea to Peter Guber, the then-Chairman of the Board and CEO of Sony Pictures. Guber became enthusiastic about the idea, seeing Godzilla as an "international brand" and set the film up at TriStar, Woods recalled, "Peter got it; he saw the movie in his head. He was like, ‘Godzilla, the fire-breathing monster?! Yesss!'" TriStar Vice Chairman Ken Lemberger was sent to Tokyo to oversee the deal in obtaining the Godzilla rights from Toho in mid-1992. Sony's initial offer included a $300,000-400,000 advance payment with an annual licensing fee for the Godzilla character, as well as production bonuses, exclusive distribution and merchandising rights for Japan, a profit percentage from international ticket sales and merchandising, usage rights to some of the monsters from the first 15 Godzilla films, and allow Toho to continue producing domestic Godzilla films while TriStar developed their film. Sequentially, Toho sent Sony a document of rules on how to treat Godzilla, Robert Fried stated, "They even sent me a four-page, single-spaced memo describing the physical requirements the Godzilla in our film had to have. They’re very protective." In October 1992, TriStar formally announced their acquisition of the rights to Godzilla from Toho to produce a trilogy of Godzilla films, with the promise of "remaining true to the original series—cautioning against nuclear weapons and runaway technology." After TriStar's announcement, many of the original Godzilla filmmakers expressed support for the film; Haruo Nakajima (who portrayed Godzilla from 1954-1972) stated, "I'm pleased. I hope that a competition will spring up between Toho and TriStar," Koichi Kawakita (special effects director of the Heisei Godzilla films) stated, "I have great expectations. I’m looking forward to seeing it, not only because I direct special effects for Godzilla films but also because I am a movie fan," Teruyoshi Nakano (special effects director of the late Showa Godzilla films) stated, "I'm pleased that a new approach will be taken", and Ishirō Honda (director of various Showa Godzilla films) stated, "It will probably be much more interesting than the ones [currently] being produced in Japan." Screenwriters Ted Elliott and Terry Rossio were tapped to write the script and submitted their final draft in late 1994. Earlier that year, Jan de Bont became attached to direct and began pre-production on the film for a 1996 summer release. De Bont's Godzilla would have discarded the character's atomic origin and replaced it with one wherein Godzilla is an artificial creation constructed by Atlantians to defend humanity against a shape-shifting extraterrestrial monster called "The Gryphon". Stan Winston and his company were employed to do the effects for the film. Winston crafted sculptures of Godzilla and The Gryphon. De Bont later left the project after TriStar refused to approve his budget of $100–120 million. In November 2018, an unofficial digital graphic novel adaptation of Elliott and Rossio's unproduced Godzilla script was released online. Entitled Godzilla '94, the graphic novel features artwork by Todd Tennant, who worked with Rossio on the project. 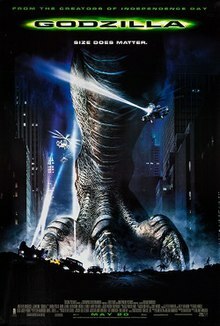 Prior to the release of Independence Day, director Roland Emmerich and producer Dean Devlin signed on to do Godzilla under the condition they would be able to handle the film their way, Devlin stated, "I told Sony that I would do the film but on my own terms, with Godzilla as a fast-moving animal out of nature, rather than some strange kind of creature." Emmerich and Devlin were the first filmmakers approached by then TriStar executive Chris Lee to do Godzilla but initially turned the offer down, Devlin stated, "Both of us thought it was a dopey idea the first time we talked. When Chris came back to us, we still thought it was a dopey idea." Despite praising Elliott and Rossio's script, Emmerich discarded it, stating, "It had some really cool things in it, but it is something I never would have done. The last half was like watching two creatures go at it. I simply don’t like that." Emmerich instead decided to develop new ideas from scratch, stating, "I didn’t want to make the original Godzilla, I wanted nothing to do with it. I wanted to make my own. We took part of [the original movie’s] basic storyline, in that the creature becomes created by radiation and it becomes a big challenge. But that’s all we took. Then we asked ourselves what we would do today with a monster movie and a story like that. We forgot everything about the original Godzilla right there." Tatopoulos showed this concept drawing (his personal favorite) to Emmerich and Devlin at Cannes 1996 which convinced them to move forward with the project. Emmerich decided to completely reinvent Godzilla's design because he thought the original Toho design "didn't make sense". Emmerich also discarded the previous design approved by Jan de Bont, stating, "I saw the creature that they designed for [TriStar’s first attempt]. Jan De Bont created a Godzilla that was very close to the original, but it was not right because today we wouldn’t do it like that." Patrick Tatopoulos was hired by Emmerich to design Godzilla. According to Tatopoulos, the only specific instructions Emmerich gave him was that it should be able to run incredibly fast. Godzilla, originally conceived as a robust, erect-standing, plantigrade reptilian sea monster, was reimagined by Tatopoulos as a lean, digitigrade bipedal iguana-like creature that stood with its back and tail parallel to the ground. Godzilla's color scheme was designed to reflect and blend in with the urban environment. At one point, it was planned to use motion capture from a human to create the movements of the computer-generated Godzilla, but it ended up looking too much like a human in a suit. Tatopoulos thought the designs that Ricardo Delgado, Crash McCreery and Joey Orosco provided for Jan de Bont took the design in a wrong approach, stating, "What they did which was a mistake in my mind was, rather than going in a new direction they tried to alter and make the old one better. And when you do that, first of all I think it’s very disrespectful. It’s more disrespectful for me to alter something existing than to take a fresh new direction." Tatopoulos took inspiration from The Jungle Book in terms of Godzilla's chin, stating, "One of the inspirations was a character I loved as a kid, the tiger in Jungle Book, Shere Khan. He had this great chin thing and I always loved it; he looked scary, evil but you respected him. I thought, let’s try to give him a chin and I felt it still looked realistic but he had this different thing that you hadn’t seen before." Tatopoulos created four concept art pieces and a 2-foot tall maquette for a meeting with Toho. Tatopoulos and Emmerich attended the meeting to pitch their Godzilla to then Toho chairman Isao Matsuoka, Godzilla film producer Shogo Tomiyama, and Godzilla special effects director Koichi Kawakita. They unveiled Tatopoulos' artwork and maquette and the Toho trio remained silent for a few minutes, Emmerich recalled, "They were speechless, they stared at it, and there was silence for a couple minutes, and then they said, ‘Could you come back tomorrow?’ I thought for sure we didn't have the movie then." Tomiyama later recalled that "It was so different we realized we couldn't make small adjustments. That left the major question of whether to approve it or not." Even though Tomiyama was not allowed to remove the artwork and maquette from the studio premise, Tomiyama visited Godzilla producer and creator Tomoyuki Tanaka, whose failing health prevented him from attending the meeting, to explain Tatopoulos' design, stating, "I told him, ‘It’s similar to Carl Lewis, with long legs, and it runs fast'." The following morning, Matsuoka approved the design, stating that Tatopoulos "kept the spirit of Godzilla." Despite receiving approval from Toho, TriStar had yet to green-light the film. Emmerich and Devlin wrote the script on spec, with the condition that the screenplay would return to the filmmakers if the studio did not immediately approve it. Emmerich and Devlin wrote the first draft in five and a half weeks at Emmerich's vacation house in Puerto Vallarta, Mexico. Emmerich and Devlin decided to abandon the Atlantis origin established in Elliott and Rossio's script in favor of the radiation origin established in the Toho films, Devlin stated, "In some of the early drafts of the script by others, they had Godzilla being an alien planted here. What Japan had originally come up with regarding nuclear radiation — you can’t abandon that. It’s too important to what Godzilla is all about." Emmerich and Devlin also decided to treat their Godzilla more animal-like than monstrous, Tatopoulos stated, "We were creating an animal. We weren’t creating a monster." Emmerich and Devlin also decided to give their Godzilla the ability to burrow underground, Devlin stated, "We discovered that certain kinds of lizards can burrow, so we decided to give him that capability." Chameleon-like skin change was also considered but abandoned later during production. Emmerich and Devlin also abandoned Godzilla's iconic atomic breath in favor of a "power breath", where their Godzilla would simply blow objects away by exhaling a strong wind-like breath. However, news of the power breath leaked before the film's release, which outraged fans and forced Emmerich and Devlin to make last minute changes on scenes involving the power breath, effects supervisor Volker Engel stated, "Dean and Roland wanted this monster to retain a certain menace and credibility, but Godzilla’s breath is something everyone expects to see at some point, So they came up with instances in which you would see something like the old breath, but with a kind of logic applied to it. We make the assumption that something in his breath, when it comes in contact with flame, causes combustive ignition. So you get this flame-thrower effect, which causes everything to ignite." As a way to make their Godzilla a threat to mankind, Emmerich and Devlin also gave their Godzilla the ability to lay hundreds of eggs (via parthenogenesis) and rapidly spawn offspring that could spawn offspring of their own and quickly overrun the planet. The first draft was submitted to Sony on December 19, 1996, then-President of Sony Pictures John Calley forwarded the script to Bob Levin of marketing to brainstorm marketing ideas. TriStar green-lit the film soon after Emmerich and Devlin's completion of the first draft, bestowing complete creative freedom to write, produce, and direct on the filmmakers, while the studio managed financing, distribution and merchandising deals. The deal also enabled Emmerich and Devlin to receive 15% first-dollar gross on the film while the original producers Cary Woods and Robert Fried would be given executive producer credits. Instead of employing Digital Domain as Jan de Bont planned for his Godzilla, Emmerich and Devlin decided to use their own effects team such as Volker Engel as the film's visual effects supervisor, Joe Viskocil as miniature effects supervisor, Clay Pinney as mechanical effects supervisor, and William Fay as executive producer of the team. Viewpoint DataLabs created a digital model of Godzilla, nicknamed "Fred", for scenes that required a digital rendition of the monster. For scenes that required practical effects, Tatopoulos' studio created a 6th-scale animatronic model of Godzilla's upper-body as well as a 24th-scale Godzilla suit donned by stuntman Kurt Carley, however, the filmmakers favored CG over practical effects and as a result, the final film features 400 digital shots, 185 of which feature Godzilla, and only two dozen practical effects used in the final film. Production began in May 1997, in New York City, and moved to Los Angeles in June. Scenes in New York were filmed in 13 days; tropical scenes were filmed in the Hawaiian Islands. The United States Marine Corps participated in the filming of the movie. An F-18 Marine Reserve pilot, Col. Dwight Schmidt, actually piloted the plane that "fired" the missiles that killed Godzilla. The soundtrack featuring alternative rock music was released on May 19, 1998 by Epic Records. It was a success on the music charts, peaking at number 2 on the Billboard 200 and was certified platinum on June 22, 1998. The original score was composed by David Arnold. The film's score was not released on CD until 9 years later, when it went on sale as a complete original film score in 2007 by La La Land Records. The album was supported by the single "Come with Me" performed by Sean Combs and Jimmy Page. Bob Levin, chief of marketing for the film, was caught by surprise when Emmerich insisted not to use full body images or head shots of Godzilla during the marketing, Levin stated, "we got indications from them that they really didn’t think that the full figure Godzilla should be at all exposed prior to the release of the film. While initially we reacted negatively to that, once we understood their thinking behind it, it became completely acceptable to us." 300 companies signed an agreement not to show the full image of Godzilla before the film was released. Prior to principal photography, Emmerich filmed a teaser trailer, budgeted at $600,000, that featured Godzilla's foot crushing the skeleton of a Tyrannosaurus Rex at a museum. It debuted a year before the film's release. A full trailer was later released with Starship Troopers. Taco Bell contributed to the marketing of the film with $20 million in media support. The marketing campaign featured commercials of the Taco Bell chihuahua chanting, "Here, lizard lizard lizard!" while attempting to trap the monster in a box. Trendmasters manufactured the toys for the film, including the 11-inch tall "Living Godzilla" and the 21-inch tall "Ultimate Godzilla". However, poor merchandise sales for the film led to a cancellation of a toyline based on the animated series. Robert Fried had estimated that $80 million was spent on marketing worldwide. The Wall Street Journal reported that the film would need to earn $240 million domestically in order to be considered a success. Godzilla was released worldwide on May 20, 1998. Sony expected the film to earn $100 million during the film's opening weekend, which fell on Memorial Day weekend. The film instead earned $55 million on its opening weekend and $74 million one week after its release, below industry expectations. The film Deep Impact opened in second place during that weekend with $19,381,788 in revenue. The film's revenue dropped by 59% in its second week of release, earning $18,020,444. For that particular weekend, the film remained in first place as the romantic drama Hope Floats overtook Deep Impact for second place with $14,210,464 in box office business. During its final week in release, the film opened in 19th place grossing $202,157. For that weekend, Lethal Weapon 4 made its debut, opening in first place with $34,048,124 in revenue. The film went on to top out domestically at $136,314,294 in total ticket sales through an eight-week theatrical run (equivalent to $209.5 million in 2018). Internationally, the film took in an additional $242,700,000 in business for a combined worldwide total of $379,014,294. For 1998 as a whole, the film was the ninth highest-grossing film domestically and the third-highest-grossing film worldwide. Godzilla received generally negative reviews from critics. On review aggregation website Rotten Tomatoes, the film has a 16% approval rating based on 75 reviews, with an average rating of 4.03/10. The website's critical consensus reads: "Without compelling characters or heart, Godzilla stomps on everything that made the original (or any monster movie worth its salt) a classic." At Metacritic, which assigns a weighted average out of 100 to critics' reviews, the film received a score of 32 based on 23 reviews. In 1999, at the Huntley Hotel Garden Room in Santa Monica, California, the film won Golden Raspberry Awards for Worst Supporting Actress for Pitillo and Worst Remake or Sequel. The film was also nominated for Worst Picture, Worst Director, and Worst Screenplay. Criticism highlighted by film critics included the film's script, acting, and directing while fans targeted the film's reinvention of Godzilla, which included its redesign and departure from the source material. Barbara Shulgasser, writing in The San Francisco Examiner, said in a one star review, "OK. Maybe the special effects are slightly more sophisticated than they were in Jurassic Park, but the techno-stuff is all getting a bit boring. When a movie is nothing but relentless action, there's little chance for dramatic tension to develop." She wrote that the film was "devoid of any discernible plot logic." Mick LaSalle in the San Francisco Chronicle, wrote that the film was "an overblown action monstrosity with no surprises, no exhilaration and no thrills... What passes for thrills is a succession of scenes lifted and extended from Jurassic Park and The Lost World. Godzilla, shot mostly from the waist down, steps on cars and strafes the sides of buildings with his tail." Rita Kempley of The Washington Post said the film "neither draws upon our fears nor revels in the original's camp charms. The picture really isn't about anything unless it is the deep pockets and shallow minds of the honchos who begat this colossal bore." She wrote further, "Size vanquishes both substance and subtlety in the overhyped, half- @#! *% and humorless resurrection of dear old Godzilla. It might well be titled Iguana Get You Sucka." The film, however, was not without its supporters. Kevin Thomas of the Los Angeles Times, wrote that the film was an "expertly designed theme park ride of a movie that packs nonstop thrills." In a slightly positive fashion, Gary Kamiya of Salon commented that "The plot is about as ridiculous as you'd expect, but for the most part its absurdities are tolerable." Joe Leydon of Variety contributed mildly to the positive sentiment by saying "Throughout Godzilla, New York endures the most sustained rainfall in all of movie history. Most of the action takes place at night, but even the daytime scenes unfold under darkly overcast skies, which, of course, makes it all the easier for Emmerich to obscure Godzilla's features for the maximum amount of time to generate the maximum amount of suspense." Roland Emmerich and Dean Devlin's big-budget lizard-stomps-Manhattan disaster flick has been written with the brain dead in mind. The script isn't just 'dumbed down,' it's lobotomized. Godzilla lives and dies on special effects alone. Writing for the Chicago Sun-Times, Roger Ebert gave the film one-and-a-half stars out of four, noting that "One must carefully repress intelligent thought while watching such a film. The movie makes no sense at all except as a careless pastiche of its betters (and, yes, the Japanese Godzilla movies are, in their way, better—if only because they embrace dreck instead of condescending to it). You have to absorb such a film, not consider it. But my brain rebelled, and insisted on applying logic where it was not welcome." Ebert also pointed out in his review that the characters Mayor Ebert and his assistant Gene were Devlin and Emmerich's jabs at his and Gene Siskel's negative reviews of Stargate and Independence Day. Siskel placed the film on his list of the worst films of 1998. In an entirely negative review, James Berardinelli writing for ReelViews, called the film "one of the most idiotic blockbuster movies of all time, it's like spitting into the wind. Emmerich and Devlin are master illusionists, waving their wands and mesmerizing audiences with their smoke and mirrors. It's probably too much to hope that some day, movie-goers will wake up and realize that they've been had." Stephen Holden of The New York Times wrote that the film "is so clumsily structured it feels as if it's two different movies stuck together with an absurd stomping finale glued onto the end. The only question worth asking about this $120 million wad of popcorn is a commercial one. How much further will the dumbing down of the event movie have to go before the audience stops buying tickets?" In Howard Hawks' The Thing, there is a great scene where scientists in the Arctic spread out to trace the outlines of something mysterious that is buried in the ice, and the camera slowly pulls back to reveal that it is circular — a saucer. In Godzilla, the worm expert is standing in a deep depression, and the camera pulls back to reveal that he is standing in a footprint. Which he would have already known. There might be a way to reveal the astonishing foot print to the character and the audience at the same time, but that would involve a sense of style and timing, and some thought about the function of the scene. Michael O'Sullivan of The Washington Post queried, "The question is this: Are the awe-inspiring creature effects and roaring battle scenes impressive enough to make you forget the stupid story, inaccurate science and basic implausibility?" Thoughtfully disillusioned, he wrote, "The cut-rate cast seems to have been plucked from the pages of TV Guide. There's Doug Savant from Melrose Place as O'Neal, a scaredy-cat military man who looks like Sgt. Rock and acts like Barney Fife. There's Maria Pitillo (House Rules) as Nick's soporific love interest, Audrey; The Simpsons' Hank Azaria and Harry Shearer as a wise-cracking news cameraman and superficial reporter; Vicki Lewis of NewsRadio as a lusty scientist. Shall I continue?" However, in a more upbeat tone, Owen Gleiberman writing for Entertainment Weekly thought "There's no resonance to the new Godzilla, and no built-in cheese value, either. For a while, the filmmakers honor the sentimental paradox that seeped into the later Godzilla films: that this primitive destroyer, like King Kong, doesn't actually mean any harm." He opined that the film contained "some clever and exciting sequences", but ultimately came to the conclusion that, "It says much about today's blockbuster filmmakers that they could spend so much money on Godzilla and still fail to do justice to something that was fairy-tale destructo schlock to begin with." Film critic Aladino Debert of Variety was consumed with the nature of the special effects exclaiming, "the title creature is wonderfully designed and the animation is excellent." Complimenting the technical aspects of the film, he summarized, "The integration of the lizard into its surroundings is for the most part very well accomplished, with rigged cars collapsing under the massive weight of Godzilla, and buildings either demolished or partially damaged. The compositing of the debris and pyrotechnics is generally good, especially when the monster runs or walks on the streets: The asphalt gives way convincingly every time the massive feet touch the ground, and a variety of CGI elements are seamlessly composited. Debris flies off buildings with every touch of the monster." Director Emmerich later admitted regretting the film's production, particularly due to the rushed shooting schedule that was required for a Memorial Day weekend release and the studio's insistence on not test-screening the film. However, he defended the film as better than critics gave it credit for, as it was financially successful, and out of all the films he directed, it was the one which parents told him their children enjoyed the most. Emmerich also conceded that he never took the original films seriously, stating, "I was never a big Godzilla fan, they were just the weekend matinees you saw as a kid, like Hercules films and the really bad Italian westerns. You’d go with all your friends and just laugh." In later years, producer Devlin admitted to "screwing up" his Godzilla, mainly blaming the script that he co-wrote with Emmerich as the source of the film's failure. Devlin additionally emphasized "two flaws" that he believed hurt the film, stating, "The first is we did not commit to anthropomorphizing Godzilla - meaning we did not decide if he was a heroic character, or a villainous character. We made the intellectual decision to have him be neither and just simply an animal trying to survive." Devlin admitted the decision was a "big mistake" and revealed the second flaw of the film was "...deciding to exposit the characters' background in the middle of the film rather than in the first act (where we always do). At the time we told the audience who these characters were, they had already made their minds up about them and we could not change that perception". Devlin concluded by stating, "These were 2 serious mistakes in the writing of the film, and I take full responsibility." During a 2016 interview on Gilbert Gottfried's Amazing Colossal Podcast!, star Matthew Broderick chuckled when Godzilla was brought up, maintaining that he liked the film. Apart from suggesting he may have been miscast, he admitted to failing to understand the film's poor reputation, given that it made "a lot of money" and was the result of a large group of people's hard work. He also described Roland Emmerich as "a very good friend." Rob Fried, who helped acquire the rights for TriStar, was angered how the studio handled the property, stating, "The Sony executive team that took over Godzilla was one of the worst cases of executive incompetence I have observed in my twenty year career. One of the golden assets of our time, which was hand-delivered to them, was managed as poorly and ineptly as anybody can manage an asset. They took a jewel and turned it into dust." Toho's current trademark for new iterations of TriStar's Godzilla. Veteran Godzilla actors Haruo Nakajima and Kenpachiro Satsuma, as well as Shusuke Kaneko (who would later direct Godzilla, Mothra and King Ghidorah: Giant Monsters All-Out Attack), were also critical of the film and its character. Nakajima stated "its face looks like an iguana and its body and limbs look like a frog". Satsuma walked out of a screening of the film at fan convention G-Con '98 in Chicago, stating, "it's not Godzilla, it doesn't have his spirit". The "Godzilla" on the film was considered so different from Toho's Godzilla by the fans and the audience that the term GINO, (Godzilla In Name Only), was coined by critic and Godzilla fan Richard Pusateri to distinguish the character apart from Toho's Godzilla. Kaneko pondered on the treatment the character was given by the studio, stating "It is interesting [that] the US version of Godzilla runs about trying to escape missiles... Americans seem unable to accept a creature that cannot be put down by their arms." In 2004, Toho began trademarking future incarnations of TriStar's Godzilla as "Zilla" for future appearances. This decision was made by producer Shōgo Tomiyama and Godzilla: Final Wars director Ryuhei Kitamura because they felt Emmerich's film "took the God out of Godzilla" by portraying the character like a mere animal. The name "Zilla" was chosen for the character by Tomiyama as a satirical take on counterfeit Godzilla products that use "Zilla" as a suffix. The character has since appeared in other media as "Zilla". The film was nominated and won several awards in 1998–99. Furthermore, it was screened out of competition at the 1998 Cannes Film Festival. Following its cinematic release in theaters, the Region 1 widescreen edition of the film was released on DVD in the United States on November 3, 1998. Special features for the DVD include; photo galleries, visual effects and special FX supervisor commentaries, the music video of "Heroes" by The Wallflowers, Behind the Scenes of Godzilla with Charles Caiman, theatrical trailers, a featurette, director/producer and cast biographies, a photo gallery, music video, and Godzilla Takes New York (before and after shots). A Pan and Scan VHS tape was also released on the same day. And a Widescreen tape was released in 1999. A special edition DVD was also released by Sony Pictures Home Entertainment on March 28, 2006. The DVD contains all of the above features as well as the "All-Time Best of Godzilla Fight Scenes" featurette, 3 episodes from Godzilla: The Animated Series, and a "never-before-seen" production art gallery. The VHS earned $8.04 million from rentals during its first week in the United States, at the time making it the biggest video opening since Titanic. The DVD sold over 400,000 units in the United States by the end of 1998. It was also reported that NBC would pay around $25 million for the television broadcast rights in the United States. The film was released on Blu-ray Disc on November 10, 2009. Special features include the visual effects commentary, the "Behind the Scenes of Godzilla with Charles Caiman" and "All Time Best of Godzilla Fight Scenes" featurettes, as well as the music video of "Heroes" by The Wallflowers. A "Mastered in 4K" Blu-ray version was released on July 16, 2013. The film will be released on 4K Ultra HD on May 14, 2019. This release includes the same special features from the previous DVD and Blu-ray releases, as well as a new Dolby Atmos audio mix. TriStar planned to produce a trilogy of Godzilla films upon acquiring the license for Godzilla in 1992. 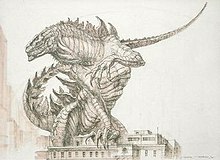 Emmerich had considered using the Monster Island concept from the Toho films with the intention of creating something wild, as well as including six or seven monsters, stating, "We’ll probably come up with other monsters because we don’t want to tie ourselves too much to certain things". Prior to the 1998 film's release, Sony felt confident enough with the film's potential box office success that they paid Toho $5 million for sequel rights, which guaranteed them to produce a second film within five years after the release of the first film, so long as it was in active development. Devlin had confirmed plans for a trilogy, stating, "We have a Godzilla trilogy in mind. The second one is remarkably different from the first one, and if it’s embraced, a third one would make a whole lot of sense. I don’t see us doing more than three, but I would love to finish out telling the story." Emmerich and Devlin commissioned a treatment from Tab Murphy titled Godzilla 2. The sequel would have involved the surviving offspring battling a giant insect in Sydney. However, the studio abandoned plans for sequels due to a lack of enthusiasm from fans, audiences, theater owners, and licensees and Emmerich and Devlin left due to budget disputes, Devlin stated, "They wanted to tailor it budget-wise, so it didn’t make sense for us creatively." Devlin stated that they left the film with an open-ending in case the film's success allowed them to return for sequels. Despite Emmerich's comments that Sony was "absolutely ready" to produce a sequel, he later revealed that he advised the studio to not produce a sequel, stating, "It’s so strange because people expected it to be the biggest thing ever, then it only did well. They are disappointed, and you have to defend yourself". Sony had considered a reboot with the new series disassociating itself from the 1998 film. An animated series was produced as a sequel and aired on Fox Kids from 1998 to 2000. In the series, Dr. Tatopoulos accidentally discovers the egg that survived the aerial bombardment before it hatches, in a minor change from the ending in the 1998 film. The creature hatches after Nick Tatopoulos stumbles onto it and it assumes him to be its parent. Subsequently, Dr. Tatopoulos and his associates form a research team, investigating strange occurrences and defending mankind from dangerous mutations with the new Godzilla, which grew to full size in a few days, serving as humanity's protector from the new threats. ^ Caro, Mark (May 20, 1998). "If Size Matters, `Godzilla' Is Really A Monster". Chicago Tribune. Retrieved May 9, 2018. ^ a b c d "Godzilla (1998)". Box Office Mojo. Retrieved November 1, 2011. ^ a b Lichtenfeld 2007, p. 218. ^ Ingoglia, Jesse (May 21, 2014). "Godzilla: Monster, Metaphor, Pop Icon". The New York Public Library. Retrieved February 26, 2018. ^ Failes, Ian (October 14, 2016). "The History of Godzilla Is the History of Special Effects". Inverse. Retrieved February 26, 2018. ^ Kalat 2010, p. 25. ^ Ryfle 1998, p. 121. ^ Kalat 2010, p. 84. ^ Sterngold, James (May 26, 1998). "'Godzilla' Roars In But Fails To Devour". New York Times. Retrieved August 7, 2016. ^ DeWolf, Rose (June 12, 1998). "It's Big, All Right - A Big Flop `Godzilla' Takes A Stomping At The Box Office And In The Stores". Philadelphia Inquirer. Retrieved August 7, 2016. ^ a b c Schaefer, Mark (November 2004). "Godzilla Stomps into Los Angeles". Penny Blood. Archived from the original on February 3, 2005. ^ a b c d e f g h i j k l m n o Aiken, Keith (May 31, 2015). "Godzilla Unmade: The History of Jan De Bont's Unproduced TriStar Film – Part 4 of 4". Scifi Japan. Archived from the original on June 12, 2018. Retrieved March 8, 2016. ^ Mirjahangir, Chris (November 7, 2014). "Nakajima and Carley: Godzilla's 1954 and 1998". Toho Kingdom. Retrieved April 5, 2015. ^ Galbraith IV 1994, p. 63. ^ a b c d Aiken, Keith (May 10, 2015). "Godzilla Unmade: The History of Jan De Bont's Unproduced TriStar Film – Part 1 of 4". Scifi Japan. Retrieved March 29, 2016. ^ a b Nashawaty 1998, p. 26. ^ Strauss, Bob (May 17, 1998). "New-Look Godzilla Unleashed in Remake". Daily News. Retrieved September 19, 2016. ^ "TriStar lands monster of deal with 'Godzilla'". Variety. October 29, 1992. ^ Elliott, Ted; Rossio, Terry. "Godzilla". scifiscripts.com. Retrieved January 22, 2014. ^ Aiken, Keith (January 10, 2007). "Godzilla 2 Rumors Unfounded". SciFi Japan. Retrieved January 22, 2014. ^ Gonzalez, Francisco (June 8, 2011). The Three American Godzilla Films, The Film Connoisseur. ^ "GODZILLA-The Films That Never Were". The Global Cafe. Archived from the original on November 11, 2013. Retrieved January 22, 2014. ^ "Complete Godzilla '94 Graphic Novel Debuts Online This Thanksgiving". SciFi Japan. Retrieved November 12, 2018. ^ Martin 1998, p. 85. ^ Bart 2000, p. 107. ^ Aberly 1998, p. 25. ^ Ryan, Mike (June 26, 2013). "Roland Emmerich, 'White House Down' Director, Explains Who And What We'll See In 'Independence Day 2' (Not Boomer)". Huffington Post. Retrieved March 22, 2016. ^ Dawson 1998, p. 118. ^ a b Rickitt, Richard (2006). Designing Movie Creatures and Characters: Behind the Scenes With the Movie Masters. Focal Press. pp. 74–76. ISBN 0-240-80846-0. ^ Rickitt, Richard (2000). Special Effects: The History and Technique. Billboard Books. p. 174. ISBN 0-8230-7733-0. ^ Aberly 1998, p. 27. ^ Reitman, Valerie (July 13, 1998). "'Godzilla' Returns Home Something of a Stranger". Los Angeles Times. Retrieved March 22, 2016. ^ a b Ryfle 1998, p. 334. ^ Martin 1998, p. 101. ^ Allstetter, Rob (August 1997). "Look Out, it's Godzilla!". Wizard (72). pp. 119–120. ^ "Story Notes for Godzilla". AMC. Retrieved January 22, 2014. ^ "Marines unceremoniously ousted from newest version of Godzilla". Marine Corps Times. May 10, 2014. Archived from the original on May 10, 2014. ^ Godzilla: The Album (1998 Film) Soundtrack. Amazon.com. Retrieved November 6, 2011. ^ Aberly 1998, p. 23. ^ Busch, Anita M. (1997-05-16). "Bell Buoys Lizard". Variety. Retrieved 2014-05-20. ^ Smith, Troy L. (2014-05-15). "5 things to remember about 1998's 'Godzilla'". Cleveland.com. Retrieved 2014-05-20. ^ "A Special Look at... The Trendmasters Living Godzilla 98". Vinyl Madness. Retrieved 2014-05-20. ^ "Ultimate Godzilla - Action Figure Gallery". FigureRealm. ^ Aiken, Keith (May 2012). "Godzilla: The Series - The Lost Trendmasters Toy Line". Scifi Japan. ^ "May 22-25, 1998 Weekend 4-day Memorial Day Weekend". Box Office Mojo. Retrieved November 6, 2011. ^ "May 29-31, 1998 Weekend". Box Office Mojo. Retrieved November 6, 2011. ^ "July 10-12, 1998 Weekend". Box Office Mojo. Retrieved November 6, 2011. ^ "1998 Domestic Grosses". Box Office Mojo. Retrieved March 29, 2016. ^ "1998 Worldwide Grosses". Box Office Mojo. Retrieved March 29, 2016. ^ a b Breihan, Tom (May 12, 2014). "Worst Godzilla Ever: Why Japan Hated (And Murked) The '98 U.S. Remake". The Concourse. Deadspin. Retrieved April 11, 2018. ^ Mendelson, Scott (May 20, 2013). "15 Years Ago, 'Godzilla' Was A Flop. By Today's Standards, It Would Be A Hit". Forbes. Retrieved March 8, 2016. ^ "Godzilla (1998)". Rotten Tomatoes. Fandango Media. Retrieved April 11, 2018. ^ "Godzilla (1998) Reviews". Metacritic. CBS Interactive. Retrieved April 11, 2018. ^ Wilson, John (August 23, 2000). "1998 Archive". Golden Raspberry Award. Retrieved November 6, 2011. ^ a b c Ebert, Roger (May 26, 1998). "Godzilla (1998)". Roger Ebert.com. ^ Vasquez, Felix Jr. (March 14, 2013). "Godzilla (1998)". Cinema Crazed. Retrieved April 11, 2018. ^ Larsen, Josh (May 6, 2014). "Godzilla (1998)". Larsen On Film. Retrieved April 11, 2018. ^ Forge, Chip (February 23, 2014). "Godzilla (1998)". Audiences Everywhere. Retrieved April 11, 2018. ^ Newquist, Kenneth (July 31, 2010). "Cloverfield: The monster movie Godzilla should have been". Nuketown. Archived from the original on January 3, 2011. Retrieved April 11, 2018. ^ a b Cirronella, Jim (June 1, 2002). "An Online Interview With Satsuma and Nakajima". History Vortex (Interview). Archived from the original on May 18, 2014. Retrieved January 22, 2014. ^ Ryfle 1998, p. 344. ^ Shulgasser, Barbara (May 19, 1998). "GODZILLA RETURN OF THE LIZARD KING". The San Francisco Examiner. Hearst Communications. Retrieved November 6, 2011. ^ LaSalle, Mick (November 6, 1998). "Size Doesn't Matter Much / Empty Spectacle Inflates 'Godzilla'". San Francisco Chronicle. Hearst Communications. Retrieved November 6, 2011. ^ Kempley, Rita (May 20, 1998). "'Godzilla': Dragon On & On". The Washington Post. The Washington Post Company. Retrieved November 6, 2011. ^ Thomas, Kevin (May 20, 1998). "Godzilla". Los Angeles Times. ^ Kamiya, Gary (May 20, 1998). "Godzilla". Salon. Salon Media Group. Retrieved November 6, 2011. ^ Leydon, Joe (May 17, 1998). "Godzilla". Variety. Penske Business Media. Retrieved November 6, 2011. ^ a b Berardinelli, James (May 1998). "Godzilla". ReelViews. Retrieved November 6, 2011. ^ Holden, Stephen (May 19, 1998). "FILM REVIEW; So, How Big Is It Again? Sizing Up the Lizard King". The New York Times. The New York Times Company. Retrieved November 6, 2011. ^ O'Sullivan, Michael (May 22, 1998). "Doing the Monster Mash". The Washington Post. The Washington Post Company. Retrieved November 6, 2011. ^ Gleiberman, Owen (May 22, 1998). "Godzilla". Entertainment Weekly. Time. Retrieved November 6, 2011. ^ Debert, Aladino (May 24, 1998). "Godzilla". Variety. Penske Business Media. Retrieved November 6, 2011. ^ Gilchrist, Todd (May 2008). "The Day After Tomorrow: An Interview with Roland Emmerich". BlackFilm.com. Retrieved November 6, 2011. ^ Aiken, Keith (May 10, 2015). "GODZILLA Unmade: The History of Jan De Bont's Unproduced TriStar Film – Part 1 of 4". Scifi Japan. Retrieved May 10, 2015. ^ Strauss, Bob (May 17, 1998). "NEW-LOOK `GODZILLA' UNLEASHED IN REMAKE". Los Angeles Daily News. Digital First Media. Retrieved May 10, 2015. ^ Vary, Adam B. (July 27, 2012). "Dean Devlin on the recently announced 'Godzilla' reboot: 'I know I screwed up my Godzilla'". Entertainment Weekly. Time. Retrieved April 11, 2018. ^ Eggertsen, Chris (June 24, 2011). "Dean Devlin Talks About the Failure of His 'Godzilla' 1998 Script". Bloody Disgusting. Retrieved April 11, 2018. ^ Nguyen, John (December 8, 2014). "1998's Godzilla producer admits mistakes". Nerd Reactor. Retrieved November 18, 2015. ^ Gottfried, Gilbert (August 15, 2016). "Matthew Broderick". Gilbert Gottfried's Amazing Colossal Podcast!. Retrieved September 15, 2017. ^ "Staff & Contributors". Scifi Japan. May 18, 1998. Retrieved January 22, 2014. ^ Suzuki, Miwa (July 11, 1998). "The US version". The Indian Express. Archived from the original on October 15, 2013. Retrieved January 22, 2014. ^ Figurski, Jim; Matsuda, Takashi (August 27, 2004). "GFW Update: Godzilla vs Zilla". Monster Zero News. Archived from the original on October 24, 2005. ^ "Festival de Cannes: Godzilla". festival-cannes.com. Archived from the original on August 5, 2012. Retrieved October 4, 2009. ^ Errico, Marcus (March 20, 1999). "Razzies Ding Eszterhas, Willis, DiCaprio". E! News. Retrieved May 9, 2018. ^ "Past Award Winners". SaturnAwards.org. Archived from the original on September 14, 2008. Retrieved November 7, 2011. ^ "Legacy: 26th Annual Annie Award Nominees and Winners (1998)". AnnieAwards.org. Archived from the original on March 13, 2012. Retrieved November 7, 2011. ^ "BMI Film/TV Awards: 1999". BMI.com. Retrieved November 7, 2011. ^ "1999 Blockbuster Awards". Whosdatedwho.com. Retrieved March 20, 2012. ^ "Bogey in Silber". de.goldenmap.com. Archived from the original on April 25, 2012. Retrieved November 7, 2011. ^ "History". CaliforniaOnLocationAwards.com. Retrieved November 7, 2011. ^ "Godzilla (1998) - DVD". Sony Pictures Home Entertainment. Archived from the original on August 26, 2012. Retrieved November 6, 2011. ^ "Godzilla (1998, Special Edition) - DVD". Sony Pictures Home Entertainment. Archived from the original on April 19, 2010. Retrieved November 6, 2011. ^ King 2002, p. 69. ^ "Billboard". Billboard. Nielsen Business Media. 111 (2): 76. January 9, 1999. ^ "The Philadelphia Inquirer". The Philadelphia Inquirer. June 22, 1998. ^ Monfette, Christopher (November 11, 2009). "Godzilla (1998) Blu-ray Review". IGN. Retrieved May 9, 2018. ^ Jacobson, Colin (April 4, 2013). "Godzilla [Blu-Ray 4K] (1998)". DVD Movie Guide. Retrieved May 9, 2013. ^ Bradley, Dan (February 11, 2019). "'Godzilla (1998)' Stomping to 4K Ultra HD This Summer". The HDR Room. Archived from the original on February 12, 2019. Retrieved February 12, 2019. ^ Murphy, Tab (October 19, 1999). "Godzilla 2 Story Treatment". Scifi Japan. ^ Aiken, Keith (January 10, 2007). "Godzilla 2 Rumors Unfounded". Sci Fi Japan. Retrieved December 19, 2013. ^ Eller, Claudia (June 13, 2000). "Sony Relying on a Compact Import for Next 'Godzilla'". Los Angeles Times. Archived from the original on February 12, 2019. Retrieved March 25, 2016. ^ P., Ken (July 16, 2002). "An Interview with Dean Devlin". IGN. Archived from the original on February 12, 2019. Retrieved February 12, 2019. ^ Johnson, Bob; Aiken, Keith (March 28, 2006). "The Ultimate Guide to Godzilla: The Series". SciFi Japan. Retrieved April 15, 2018. ^ The U.S. releases for Godzilla, King of the Monsters!, King Kong vs. Godzilla and Godzilla 1985 featured additional footage with Western actors shot by small Hollywood production companies that merged the American footage with the original Japanese footage in order to appeal to American audiences. Invasion of Astro-Monster was the first Godzilla film to be co-produced between Japanese studio Toho and American studio UPA. Aberly, Rachel (1998). The Making of Godzilla. HarperPrism. ISBN 0061073172. Bart, Peter (2000). The Gross: The Hits, The Flops: The Summer That Ate Hollywood. St. Martin's Press. ISBN 0312253915. Dawson, Jeff (1998). We’re Off to See the Lizard. Empire #110. Galbraith IV, Stuart (1994). Godzilla's American Cousin. Filmfax #45. Kalat, David (2010). A Critical History and Filmography of Toho's Godzilla Series (2nd Edition). McFarland. ISBN 9780786447497. King, Geoff (2002). New Hollywood Cinema: An Introduction. Columbia University Press. ISBN 9780231127592. Lichtenfeld, Eric (2007). Action Speaks Louder: Violence, Spectacle and the American Action Movie. Wesleyan University Press. ISBN 0819568015. Martin, Kevin H. (1998). The Sound and the Fury. Cinefex #74. Nashawaty, Chris (1998). Stomp the World, I Want to Get Off. Entertainment Weekly #433.